« Why do Christians and Muslims Reject Evolution? This article examines how evolution explains not just our physical characteristics, but also the areas that traditionally have been seen as unexplained by science- such as morality, meaning and values. It goes on the explain how evolution explains religion, souls, gods and is even evident in the bible. This article continues a series that started with what we can possibly know and then the optimal way to obtain this knowledge. The third article used these tools to examine what a universe created by a god would look like, and demonstrated that our universe does not match that expected from a god. The alternative to a universe created by a god is a naturalistic origin to the universe. The most common criticisms from theists to the naturalistic explanation usually focus on three key areas: the origin of the universe, the start of life, and the evolution of humans. 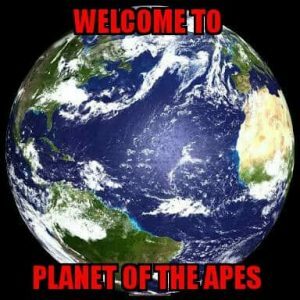 This article jumps straight to this third area of contention and examines how evolution explains humanity. It explains how many fundamental questions about humanity, which we have struggled with for millennia, are now being addressed by evolution, forming one elegant picture. “Science tries to document the factual character of the natural world, and to develop theories that coordinate and explain these facts. Religion, on the other hand, operates in the equally important, but utterly different, realm of human purposes, meanings, and values—subjects that the factual domain of science might illuminate, but can never resolve.” – Stephen Jay Gould. Gould’s statement is made on the assumption that these aspects of humanity were independent of scientific explanation. i.e. That observed facts cannot address the origin of meaning, purpose and value. The article explains why Gould is wrong. Evolution explains our physical form. 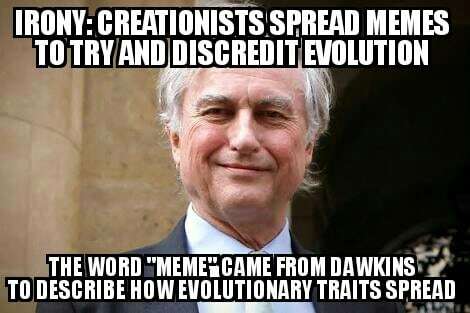 Most educated people have no problem accepting that evolution occurred. Religious people who accept evolution see evolution as the tool used by a god to develop life. They accept that evolution explains our physical characteristics. Our form is highly complex, leading many to leap to the conclusion that we must have been designed; however our form is also highly compromised. We would expect a perfect designer to find the best possible design solutions. Our form would not just be optimised, it would be optimal- i.e. the perfect creator implements the perfect solution. On the other hand a blind, non-intelligent selection process such as evolution would result in an optimised but seldom optimal form- and that is exactly what we find. We also have overwhelming evidence how our form has changed over time (not just from fossils but from our living animal relatives), contributing to this compromise: Whether it is our large heads that make human childbirth not just painful but highly dangerous, the shape of the pelvis and the twisted route that the infant must pass through, the bent lower backs from our transition from quadruped to biped, The huge number of now-redundant bones in our feet, or the needless blind spot in the eye. Evolution also explains our physical senses. Our senses provide a clear survival advantage- whether sensing prey, sensing danger, or just finding our way around. Feeling hot causes pain, triggering movement until the creature doesn’t feel hot. Similar if a creature is being attacked or swallowing in response to the presence of food. Our list of senses is much larger than the traditional five (i.e. touch, taste, hearing, sight, smell). For example our vestibular sense provided balance and detection of movement. We detect temperature. Temperature sensing is detection of intra-red radiation, which is part of the electromagnetic spectrum. Visible light is also part of this spectrum. This reveals how even a simple detection organ such as skin can form the foundation for the much more complex eye to later evolve. We have a sense of where our limbs are (Proprioception). Our sense of pain is distinctly different from our sense of touch. We then have a large range of internal senses such as hunger. The senses provide input to the brain enabling decisions to be made that influence our survival. Evolution also explains our brains. The first neurons most likely enabled motion– they controlled the twitching of muscles and so they were control systems to drive muscles. The first muscles encouraged the flow of water in a particular direction to enable nutrients to be filtered. This same convulsive motion that we see in sea anemones soon resulted in enabling motion away from danger. This is the same pulsing movement we see in jellyfish and in our gut as it pushes food along. This system started as blind to the environment. This soon expanded with feedback systems- inputs (senses) brought information from the outside world, which the neurons then used as triggering events. So the brain then developed to map the outside world. In the absence of intelligent design, it became a guessing and modelling machine, and so connecting the dots of input information and jumping to conclusions was the result. This jumping to conclusions is how superstitions form. Intuition is the benefit of this and false conclusions are the disadvantage. The result is a brain that is poor at logic. As I have mentioned in my previous articles, we have a large list of cognitive biases. A simple, intelligently designed calculator is far more logical than our huge brain. Curiosity is a double-edged sword: too little and you miss opportunity, too much and we are likely to stumble into danger or death. We find a wide range of curiosity amongst individuals- enabling the reckless to make discoveries whilst the timid of the species provide security. Evolution also explains our emotions. Seeing and feeling that an animal is chewing on your leg is no help to survival without an emotional response to enable the brain to make a value judgement and a decision about how to react. The evolved emotions are not limited to simply pleasure and pain- all our emotions provide a survival benefit: love, lust, jealousy, shame, guilt etc. There is no basis to claim that some emotions are evolved but others are not. From our emotions we obtain a sense of value- what is important versus what is despised. First order justice (where we detect when we are being treated unjustly) comes from these personal emotions. Animals such as dogs experience first order justice– a dog knows when another dog is getting a reward for an act that it may be missing out on itself. Have you ever found yourself involuntarily copying someone else’s movements? Perhaps sitting in the same position, or moving your arm when they do, or catching a yawn? 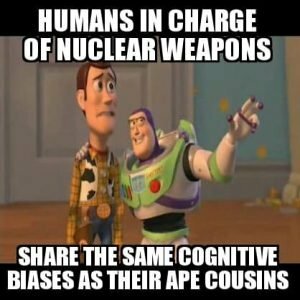 We have evolved mirror neurons which fire in response to an observed action. These are vital learning tools for infants, who learn by copying the actions of the parent. These neurons also fire when we see someone getting hurt. Thus mirror neurons are vital to survival, and a consequence of mirror neurons is that we feel empathy towards others. From empathy we obtain second order justice- this is the ability to be aware that others may feel hard done by. For example when we are rewarded but they are not. Second order justice has been measured in bonobos for example. With empathy we have the foundation for morality, which is a result of social evolution. B) or morality is a completely subjective, baseless opinion. We see that there are common moral foundations across all cultures. The commonality led early philosophers to conclude “we all agree, so morality is universal”. Yet we also see that we have struggled for thousands of years to agree on exactly what is right and wrong. We label some people amoral or immoral- concepts that would be impossible if morality was objective, independent and universal. The philosophers presented us with a false dichotomy- evolution reveals that morality is neither universally objective nor pure subjective opinion. Like our sense of sight it has a common origin for all humans, so we agree on the similarities. But just like our sight where not everyone has perfect vision (and some people have no vision at all), we see a wide range of abilities for the sense of morality. Psychopaths have the ability to switch off empathy, while it appears that Aspergers may be the result of experiencing too much empathy. Autism appears to have a strong association with our ability to empathise. As well as having a wide range of the sense of morality, the interpretation of morality is also wide. This is because we evolved moral foundations. The relative importance of each foundation will impact the ethical system we build on top of them, and the decisions we make can vary wildly. For example if we value caring for others over deferring to authority we are more likely to resist following orders resulting in war crimes. Survival of the self and survival of the clan are competing pro-survival traits. Conscience is the conflict of these two pro-survival traits. Survival of the clan includes clan favouritism and fear of outsiders- which can result in racism, slavery, oppression and wars. 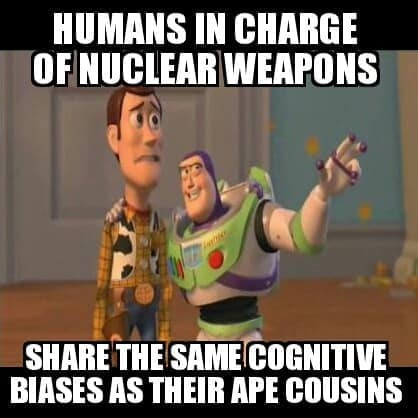 Exactly who we include in our clan varies- and this results in a huge difference in our resulting morals- some include only themselves, or their family, or their tribe, or their religion, or their nation, or sports team, a few consider the human race, and some consider the whole planet. We use the term “sense of morality”, and this is an entirely appropriate description. Our morality is internal, innate and evolved. As with all our other senses it gives us a sense with which we interpret the world- in this case the social environment. We use our sense of morality to navigate social relationships and maintain our survival. We actively select out people with a poor sense of morality- we incarcerate them and so limit their ability to procreate: social evolution at work. Evolution therefore explains our sense of right and wrong. In summary: we have a “common but not universal subjective moral core”. All possible sense of value that we hold comes from emotion. Value is a measure of how we feel about something. Which means that all value in the universe (at least whilst we have not detected alien life) is a consequence of evolution. From value comes meaning- if nothing has value it has no meaning, and vice versa. Thus we see that evolution explains every aspect of us- whether our curiosity, love, morality- as well as meaning, purpose and value. Although many religions have accepted evolution, most fail to explain evolution. Since evolution was discovered after the formation of the popular religions, it exposes a hole in their human-constructed world view. Evolution however beautifully explains gods, religion and the basis for the myth of souls. This is concisely explained in the book “Why we believe in gods”, which is thoroughly recommended reading. decoupled cognition, theory of mind, mind-body dualism. hyperactive agency detection, intentionality, intuitive reasoning, minimally counter-intuitive worlds, promiscuous teleology, transference, romantic love, dreams. Attachment, childhood credulity, costly signalling, deference to authority, precautionary reasoning. Kin psychology, mirror neurons, moral-feeling systems, reciprocal altruism, ritual behaviour, song and dance. 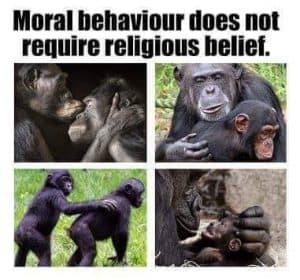 Now that we have determined that morality, senses, emotions, values and intelligence are all consequences of evolution, it is worth examining our representations of gods. Gods are often portrayed with physical attributes: eyes, ears, hands etc. Why would a creator of the physical need organs to detect and interact with its work? We portray gods with morality and emotions- if these traits are an optimised consequence of evolution, wouldn’t a god need to undergo an evolutionary process to obtain these? We see that our intelligence developed from far simpler origins through an evolutionary process- are we supposed to assume that the complexity of a god’s intelligence “just happened by chance”, or worse: “just is”? 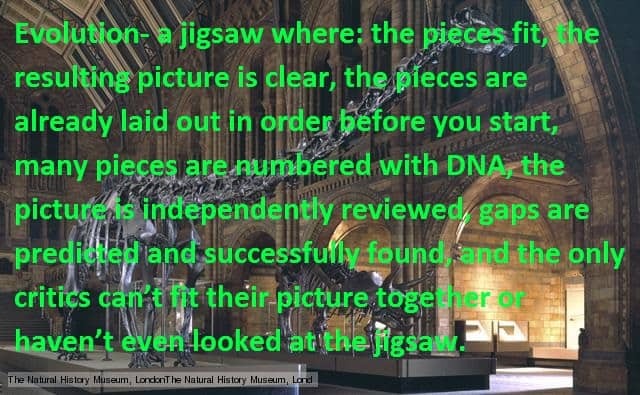 Arguments against a naturalistic origin always look at the complexity of the result and say “what are the chances”, however evolution is built on the overwhelming evidence where we see that complexity has come from simple, mindless origins. Meanwhile the arguments for gods never explain the far greater complexity required of the god. Greater complexity means lower probability- an infinite, omnipotent, omniscient intelligence is far more complex than the mindless quantum state to where we have tracked the universe back. 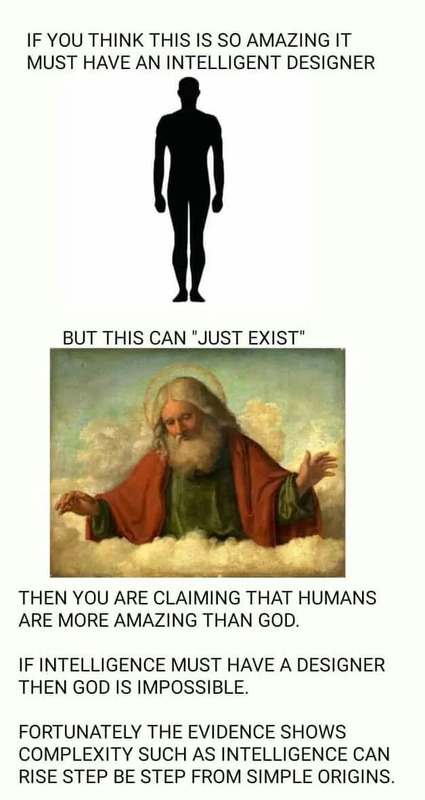 Which is more amazing: man or God? Morals cannot be mandated from an external source. Only laws can come from outside sources, not morals. We only call laws moral if we agree with them internally. The same applies for meaning- a god, just like the manufacturer of a machine, can define the purpose of its creation- but that does not automatically make this purpose worthwhile to us. Note that if our internal morality came from a god, then this would still be a subjective morality- i.e. the opinion of another subject. Just because morality is dictated does not give it greater worth. 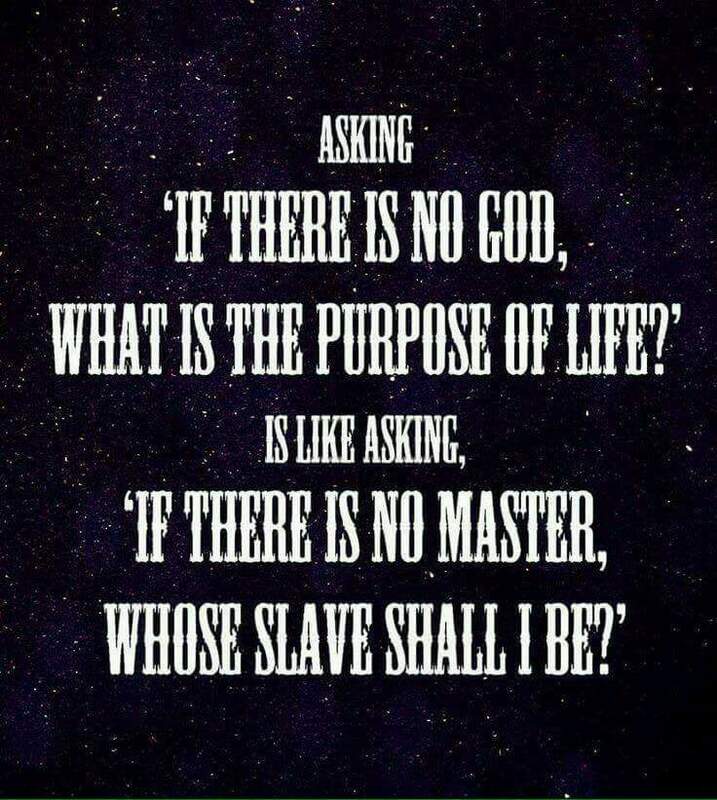 Essentially all theists do is defer responsibility to a “slave master”- and they don’t stop to think that this is actually worse than having your own morality and meaning. 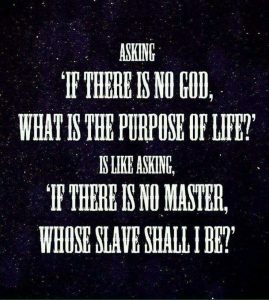 A person’s life does not suddenly become more meaningful because they defer decisions and control to a slave master- it is the surrender of reason. This is of course explained by the moral trait of deferring to authority- the opinion of the authority is given greater value than our lowly opinion. Consider for example if we could make a conscious chair. As the creator we dictate the purpose: to be sat on. Imagine we give the chair the option to choose if it accepts its purpose- how would it decide? It would consider its own values which are the basis for its own morality. These values could only have come from us. What sort of cruel creator would we be to make a chair that doesn’t want to be sat upon? 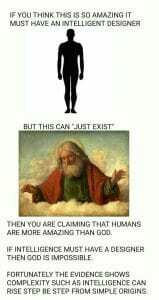 Thus the idea that humans have the free will to reject god is absurd. (Free will however is impossible, as I explained previously). 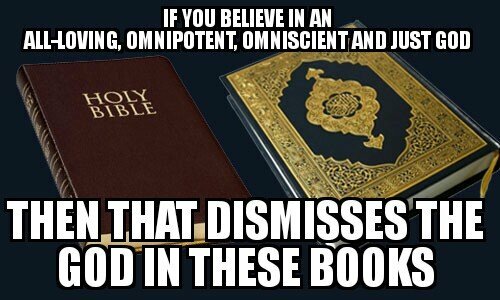 A god at best can dictate laws and purpose, but morals and meaning are internal to the individual. Therefore god is not required for morals and meaning (he is just one possible, unsubstantiated source for our internal sense). This does not make morality less valued, completely random or meaningless. Evolution explains the origin of our morals accurately, which are driven by feelings, and feelings allow us to define our own meaning and are the source of value. Religion does not explain evolution, but evolution explains religion. 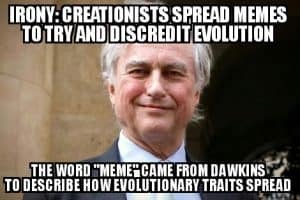 The Bible does not explain evolution, yet evolution explains the bible. This section looks particularly at the biblical text, and demonstrates how it is a consequence of evolution, and a beautiful example of evolution. The bible starts with a creation myth- a consequence of our evolved curiosity to comprehend the world and our place in it, in order to best survive in it. We see assigning of agency (assuming intelligence and intent) to natural phenomena such as floods and fires, success and failure of crops- i.e. 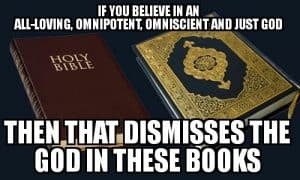 jumping to conclusions resulting in the invention of various gods. Religions find niches just as life does, and thrive when they fit that niche. The infant-murdering religion of Moloch battled between deferring to the authority and the evolved trait of protecting our young. 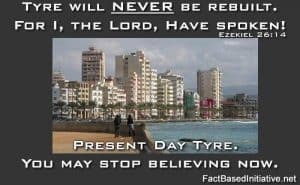 Evolution’s stronger force won and the god became extinct. Radical, violent, masculine gods suit people who are competing to survive. (Feminine gods suit abundant, nurturing, cooperative environments such as the Amazon). The early bible documents the struggle to move from family-based social structures to larger and larger clans. We see the struggle for social order, deferring to authority (whether God or human rulers), the struggle to adapt morality into laws. As the society grew from family groups into a larger clan of distant relatives, we see In Exodus and Leviticus the struggle to adapt from a social structure that worked in small groups for millennia (allowing natural selection to build a sense of morality and cognitive tools that fit) to one that works in large groups. We had not evolved to cope in city-sized communities, so we struggled to adapt. We still struggle with this today. Laws compensate for an innate morality not having adapted for large societies. Our evolutionary desire to mate, which works well in small family clans, becomes a social burden. Rules are built to curb our desires. The book of Numbers gets its title from the census. A census in the bible has one purpose and we see that purpose in who was counted: men of fighting age. The nomadic tribe was getting too large for nomadic life and needed a land of its own and so needed to invade. Having “the authority and blessing of God” to invade is a fantastic motivator for a soldier and demonstrates the deference to authority that allows the suspension of care and compassion. This evolutionary trait where the needs of the in-group crush compassion for the out-group was made famous by the Millgram experiment. God at this time cared only for the Chosen people, and all other nations with other gods could be dismissed as abominations. God in the early bible is presented as an anthropomorphic, fallible, emotional, racist, aggressive, jealous warmonger. Modern Christians are raised on a completely different God- one that has evolved to “God IS love”, who wants his people to turn the other cheek and love their neighbour, a god that loves all people especially the innocent, and is always just. Yet many modern Christians don’t think twice about the invasion of the promised land- the genocide of children and the taking of girls to be made wives was rationalised because these people were enemies of God. Yet we see that a loving and just god cannot simply give land to his chosen people, they must build their numbers, go to war and slaughter the innocent. The idea of “the promised land” is made a mockery of when Moses sends spies to various lands (Numbers 13) to see who is weak enough to invade and rich enough to make it worthwhile- not who is most evil in the eyes of God. Modern Christians who accept this as justified are also guilty of suspending the moral traits of care, sanctity and liberty in favour of loyalty and authority. The aggressive god of the Jews has not been as successful as the completely opposite Christian god- a loving, just god that is more in line with social evolution: work together, cooperate, don’t cheat, look after your fellow man, love your neighbour, and in particular engage in the evolved trait of reciprocal altruism: do unto others as you would have them do unto you. The actual implementation of the Christian religion is different to what Jesus requested. Jesus did not take into account cheating, which is also an evolved trait. The history of the Catholic Church reflects how cheating can survive but only up to a limit. There has never been a Christian nation without an armed force (and even the Vatican has an army). No nation that was prepared to turn the other cheek rather than resist being invaded (or in some cases to be the invaders). Here we see that when Jesus contradicts our evolutionary nature, Jesus loses. Tagged Evolution, meaning, meaning of life, morality, values. Bookmark the permalink. "Maturity is the ability to face the truth." I seek to live a life based on reality and truth. This has led to a world view with some gaps, but as yet no contradictions. I am open to correction of my views, where gaps can be reduced and contradictions can be exposed. My writings reflect my journey and discoveries. great article, perfectly time after yesterdays release too!